We can make any size filter! Click here if you don't see your size! NOTE: Custom made air filters do not come individually wrapped. Price is for a full case of 6 Filters. 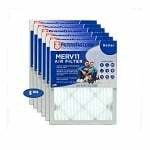 The Filters Fast MERV 8- 2" Furnace Air Filters 6-PACK is a set of air filter replacements that are essential for your home. Upgrade your 1 inch air filter with our new six pack of 2" MERV 8 air filters. Like our 1 inch MERV 8 filters, these 2 inch furnace filters will reduce dust, pollen, pet dander and other contaminants from your air. By doing so, you will help eliminate symptoms caused by allergy and sinus irritations, such as coughing, sneezing and watery eyes. Using a quality furnace filter such as this one not only protects your family from airborne contaminants, but it also protects your HVAC system. Why upgrade to a 2 inch furnace filter? Our 2 inch air filters are an inch deeper than traditional 1 inch furnace filters, and as a result they have a greater surface area than standard home air filters. Before upgrading your 1 inch air filter with a 2 inch air filter, please be sure to check that your return grille can accomodate a 2 inch filter. 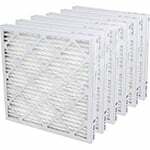 Often, 2 inch air filters are used in commercial air filter applications like offices, hospitals and schools. Our MERV 8 air filters contain 10 pleats per linear foot. Pleated air filters have a greater surface area than non-pleated filters, and as a result they have more room to capture airborne particles. Our MERV 8 furnace filters are electrostatically charged and will not retain moisture, which can lead to the growth of mold and bacteria. for optimal performance, please change these furnace filters every 3 months. MERV, or Minimum Efficiency Reporting Value, indicates the efficiency of an air filter. Most grocery store filters you see have a rating of MERV 1 or MERV 2, which will remove practically nothing from the air and cause your HVAC system to work harder than it should. 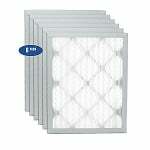 We also carry a MERV 13 2" air filter.